WUBA is a recent example of kind of swing trade I look for. It is based on the principle of momentum bursts. Stocks move in momentum bursts of 3 to 5 days. During this 3 to 5 days period stock would go up 8 to 20% ( lower priced stock can even have bursts of up to 40%). Higher priced stocks above 40 tend to move in momentum bursts of 5 to 25 dollars. Such bursts may or may not have clear identifiable catalyst. You need to know nothing about the company to trade this kind of burst. This is a pattern and probability based trade. All such momentum bursts start with a range expansion. The first day of the move is range expansion day. Often there is also volume expansion along with range expansion. The price moves in the direction of range expansion. When there is range expansion it attracts breakout traders, it attracts other momentum players, day traders, quants and so on. That results in continuation of move for few days. Range expansion basically means a day which is up bigger than last 5 to 10 days bars. A range expansion preceded by series of range contraction days is good candidate in this setup. Moves preceded by orderly range contraction can be explosive. A successful momentum burst will lead to immediate follow through. Say a stock breaks out in the morning, it will continue to go up through the day and will have immediate follow through in next 2 to 3 days. And the follow through should also be of big 4 to 5% plus magnitude on second or third day. 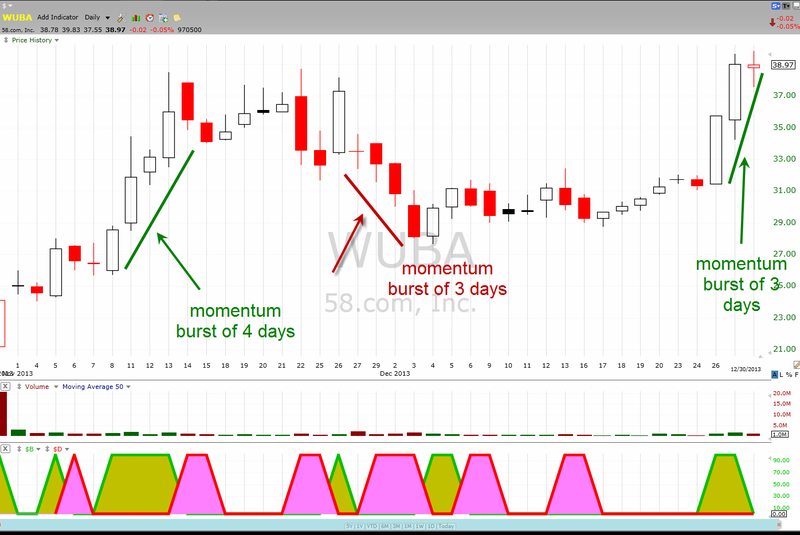 In most cases the momentum dies down in 3 to 5 days. If you keep holding after the 3 to 5 days period, you would often see the stock ends up giving up all the burst gains and may not have another momentum burst for several weeks or months. Sometime the burst gains vanish intraday itself. Depending on price of the stock such momentum bursts can be of 8 to 40% magnitude. Lower price stocks tend to make bigger moves. For a stock trading below 5 dollars a breakout day move itself might be of 10 to 20% magnitude. For traders with small accounts that offers good opportunity. As a practical matter if you have large amount of capital to trade with it is difficult to grow your account by just focusing on these low priced stocks. You might have to buy lots of 50000 to 100000 shares for meaningful difference to your account. Lower float stocks make bigger moves. Low float and high demand creates explosive moves. If you see in any year the most short term explosive moves will be on extremely low float stocks. For those with smaller account size there is distinct edge in trading low float stocks. No specific catalyst is needed for these momentum bursts. Why do these moves happen. ?In some case there might be a specific news catalyst on day of first range expansion day , but in vast majority of these kind of momentum moves, there is no clearly identifiable catalyst. However tracking news on daily basis might help you enter some of these momentum bursts very early and magnify your profit. During bull moves in overall market such momentum bursts have been observed for over 100 years. This is structural nature of market. Stocks seldom run up or down smoothly. A 30% move in stock over 3 months in a stock might be completed in 2 momentum bursts of 10 to 15% in just 5 to 6 days. Rest of the time te stock might retract or go in range. In a year you will probably find 5000 to 10000 such 3 to 5 day setups when both bullish and bearish setups are combined. Momentum burst kind of swing trading allows you to grow your account with very low risk. For a mere 3 to 5 day exposure to market you capture the most explosive part of the move and you are not seating in dead periods holding stock waiting or anticipating a breakout which may or may not come. Trading this kind of setup requires extremely good ability to ruthlessly cut losses if a trade does not work immediately . It also requires skill to exit when things are still in explosive phase and not wait for reversal. Per trade profit on these kind of trades will be on an average just 5 to 10% as you are only going to get part of the 8 to 20% move. By the time you enter on breakout day the stock might be up 4 to 10% , so you will not be able to capture that part of the range expansion move. To trade this kind of setup you need to be willing to do 200 to 1000 or more trades in a year. You make money by compounding these small gains. So this is high frequency and low per trade profitability method. But for a skilled trader this can lead to explosive returns. This is fairly simple strategy to master and can make you millions.